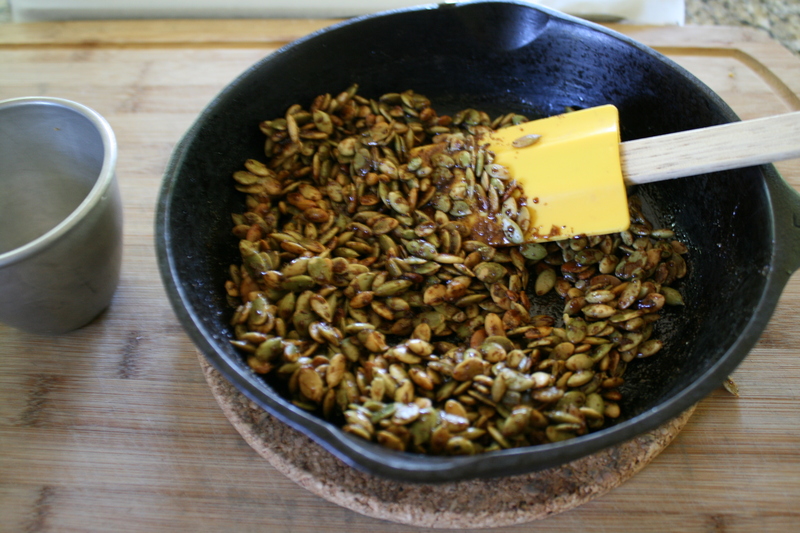 I saw today’s recipe for Maple Chai Spiced Pepitas on an episode of The Kitchen on Food Network, and they’re perfect for a healthy, low-fat autumn/Halloween/Thanksgiving treat. I’m watching my fat intake these days because of Ebenezer (my pancreas), so I’m always looking for low-fat snacks. I also think these would make another excellent hostess gift. We’re always looking for unusual hostess gifts this time of year – there are so many parties and gatherings to go to, and you need a supply of little gifts ready so you can just “grab and go”! Anyone would like this snack. I would LOVE to get these for a hostess gift. I like pepitas as a snack, and I like chai tea. The flavors are a bit sweet and salty – perfect! 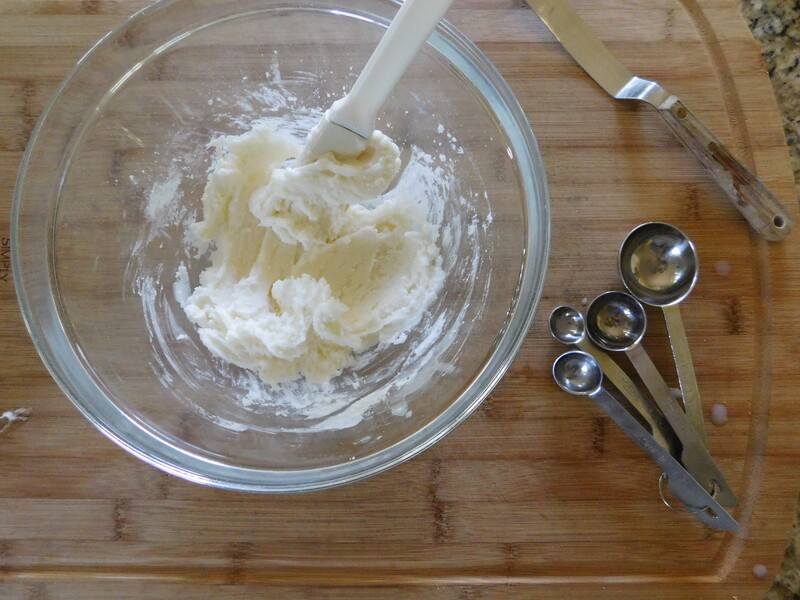 Another plus – this snack is so unbelievably easy to make – simple dimple – I like that. I like that a lot. 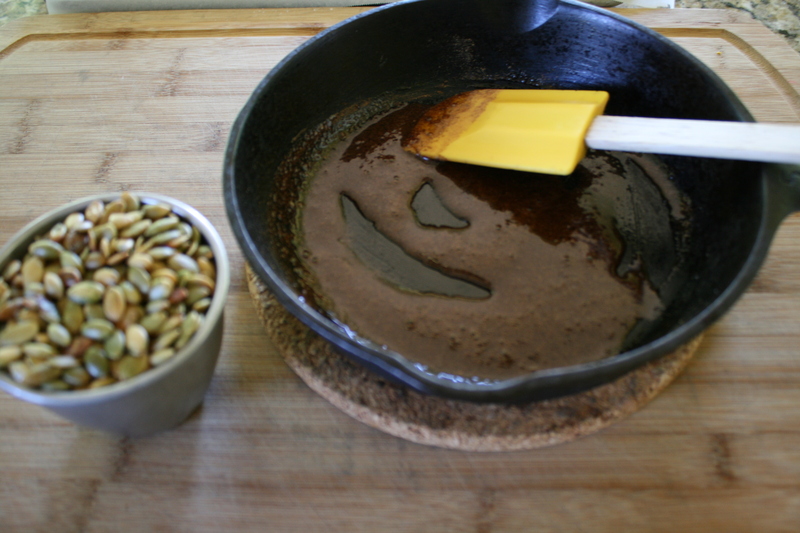 Remove pepitas from the pan and return pan to stove top (or, if you use already roasted pepitas, just put the pan on the stove and add the following). 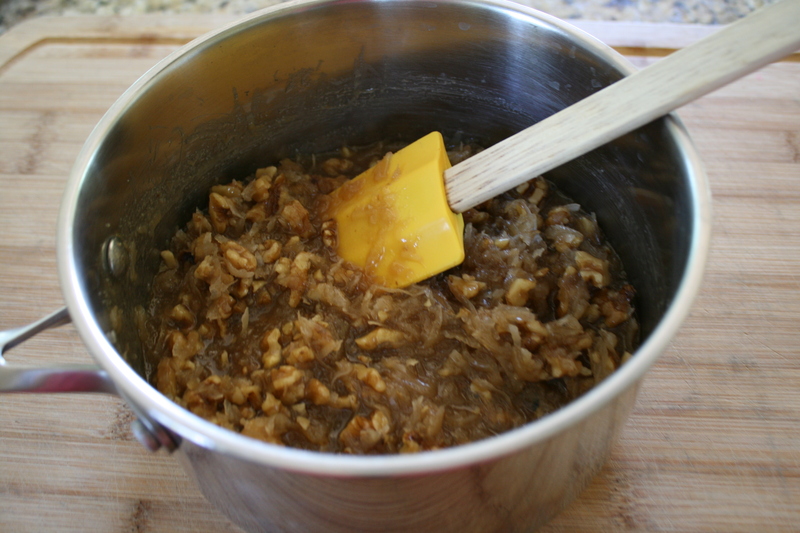 Cook, stirring constantly, until the mixture is combined and sugar dissolves, 1-2 minutes. Stir in the spices and turn off the heat. 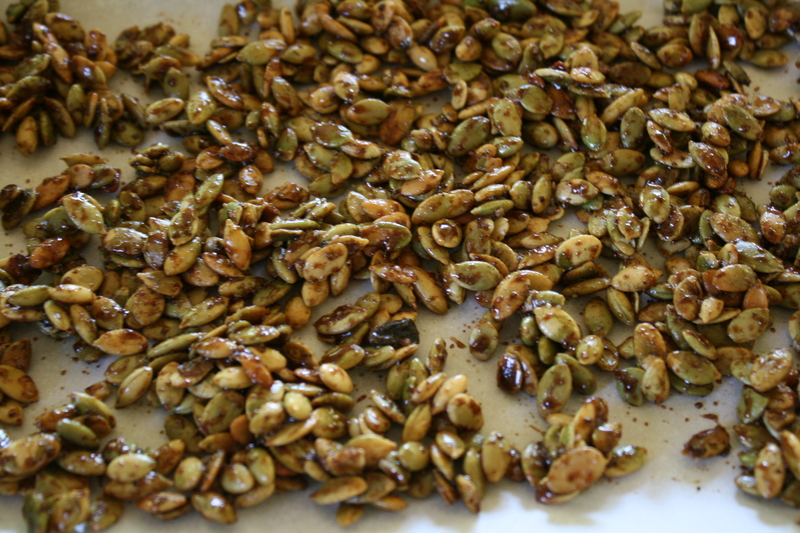 Add the toasted pepitas and toss until the seeds are evenly coated. Pour over the parchment lined baking sheet and spread to cool completely. This really is an incredibly easy recipe. 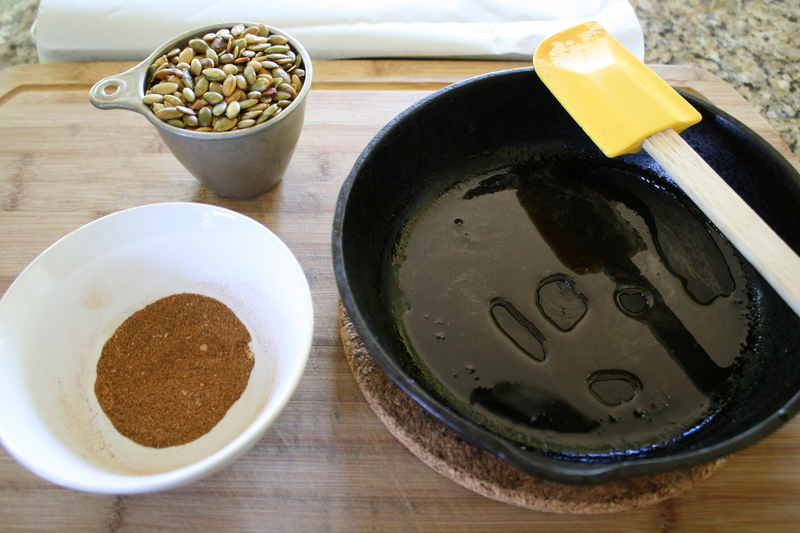 Have your pepitas ready, mix up the spices, and get your wet ingredients into the pan. Once the wet ingredients are heated and the sugar is dissolved, add the spices and stir it up. Next, the pepitas go into the spiced mixture. Stir them up so they’re all coated. 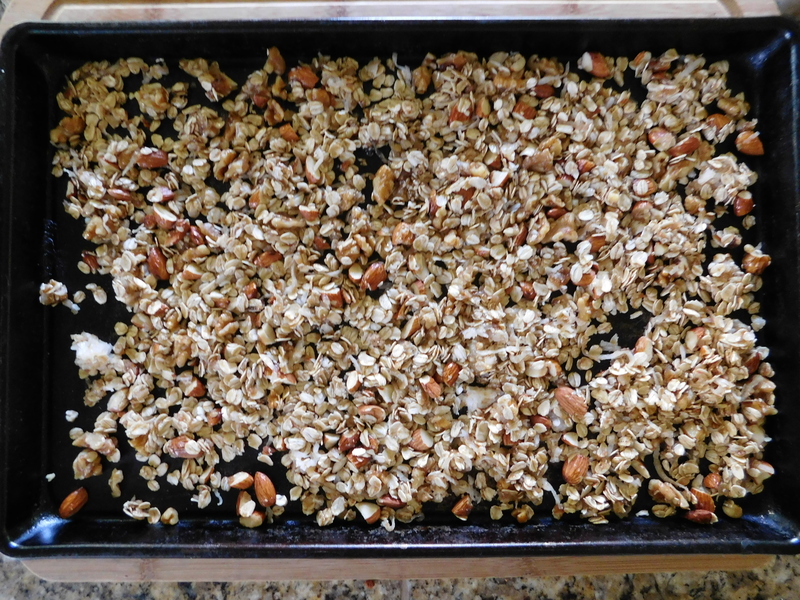 Spread the pepitas onto the parchment lined baking sheet and let them dry. That’s it. Simple dimple. Easy peasy. They’re so tasty with the spicy flavor of chai tea. Yum. Sweet, spicy, and salty – how bad can that be? Try this delicious snack that’s also pretty healthy. 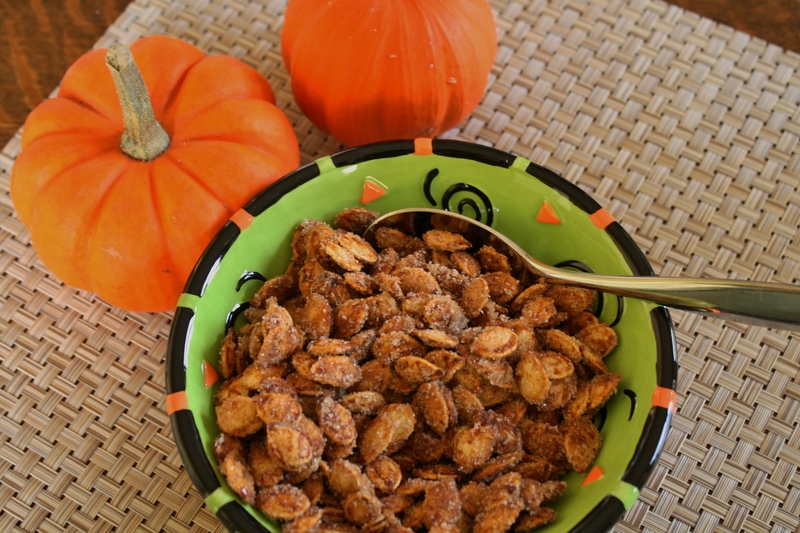 You’ll love these Maple Chai Spiced Pepitas – they’re the perfect little gift or snack for fall/Halloween/Thanksgiving! These Spice Bars are just about the perfect fall treat. 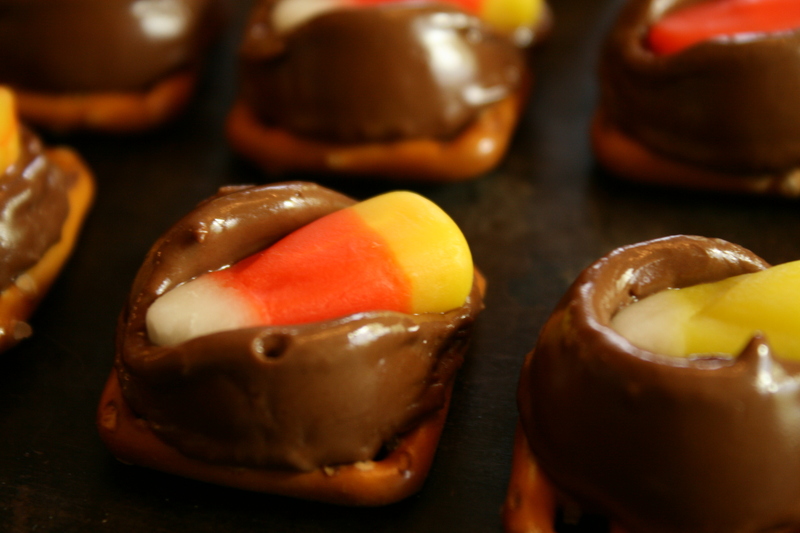 They’re easy to make, smell like your favorite fall candle while they’re baking, and taste absolutely delicious. 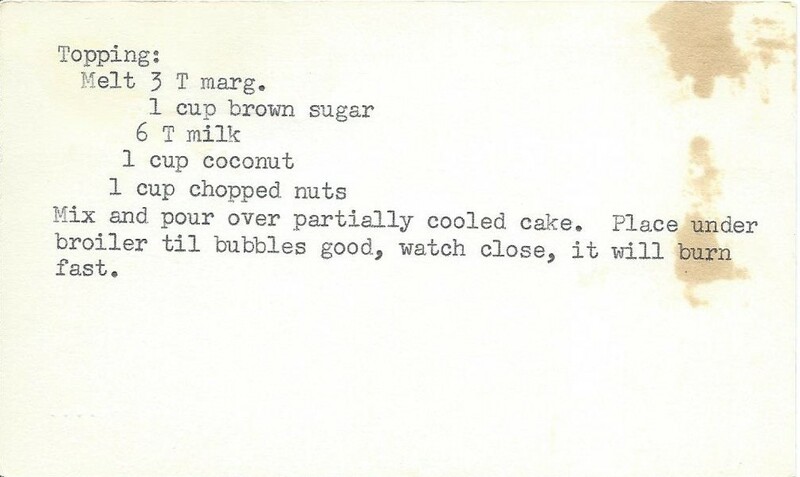 This recipe is another one from one of Grandma’s old church cookbooks. 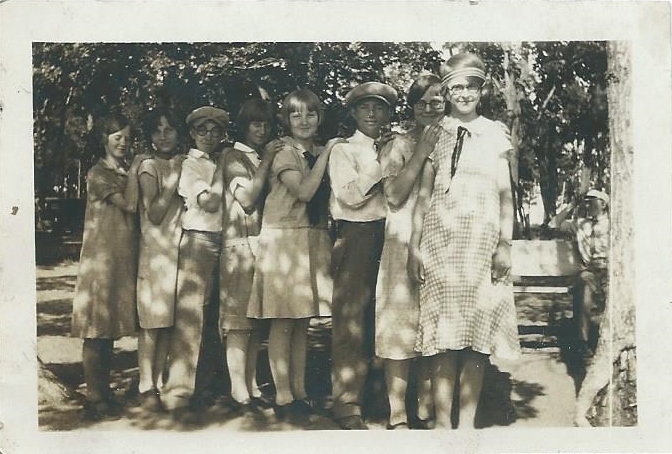 I saw this photo of what I think was one of Grandma’s (she’s right there in the middle with the big bow on her dress) Sunday School classes – or I guess it could have been a class in school – and I think about these girls (and boys) getting together for coffee or events as they grow up and have their own families. Most of the kids in the area where she grew up probably stayed there in the small town near their farm. Those girls probably used some of these same old church cookbooks while raising their families. There would have always been Sunday dinners, christenings, baby showers, wedding showers, weddings, birthday parties, church events, etc. to use those recipes for. Today’s recipe just got me thinking about how perfect they would have been for all of those kinds of events, as well as afternoon coffee. All of the church cookbook recipes were perfect for new brides starting out on their cooking and baking lives. Even if the brides moved somewhere else with their grooms, I bet they took those cookbooks with them as a piece of home. Recipes can do that – bring you right back home. 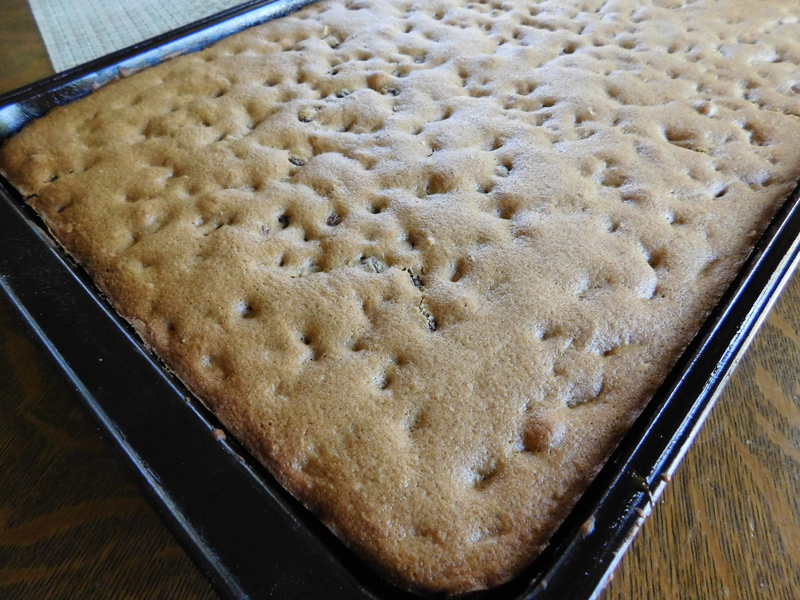 I like that this recipe is a bit different from other bar recipes, in that they are baked on a baking sheet instead of a cake pan, and they’re cut in strips instead of squares. I guess you could cut them anyway you want to, but it’s a little different to have it written into the recipe. Let’s get these bars baked so we can have some with our afternoon coffee! 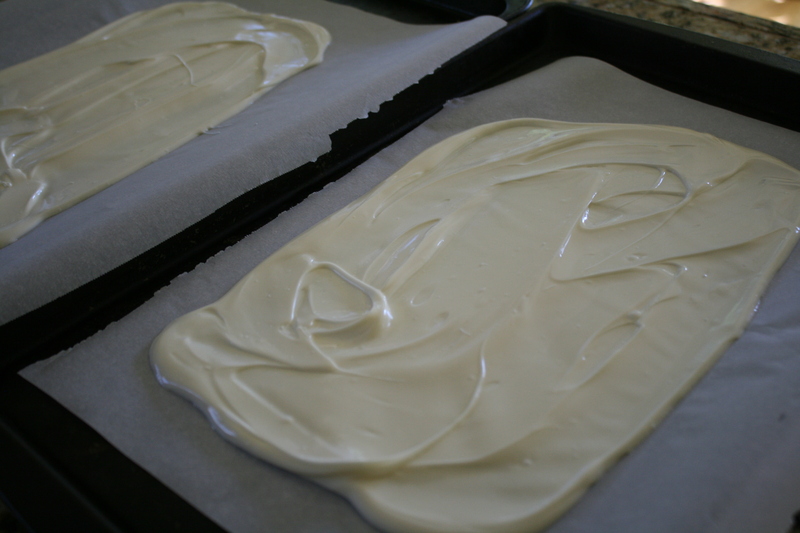 Pour batter into 7″ x 12″ baking sheet (I lightly sprayed the pan with non stick spray). There are some pretty simple ingredients in this recipe, but because of all of the spices in there, it really does smell like a fall candle when they’re baking. It takes some work to get all the batter spread on the pan. The recipe says to “pour the batter” into the pan, but this was definitely a thick batter. It’s more of a “spread it” kind of thing. Oh man, this smells so good! The frosting, or glaze, is also kind of thick, and while the lemon extract was delicious, I would use real lemon juice next time. I just like that flavor better. Here you can see how thick the frosting was. It pulled up the top of the bars. They were still just as delicious, but even though I added about 2 extra tablespoons of milk, I would add more milk or lemon juice next time. Because I lightly sprayed the pan with non stick spray, the bars came out very easily and I was able to take out the first whole row and cut them on the board. From then on I cut them in the pan. These bars are so good and smell so good, the whole house smelled delicious – it smelled like Grandma and Grandpa’s house – it smelled like home. They’re spicy with the raisins and walnuts in them, and then to top it all off, they have that delicious lemony frosting or glaze on the top. That’s it – we can’t wait anymore – time for a cup of coffee and a Spice Bar! As I said in last Tuesday’s post, I made two pans of bark and today I’m sharing another bark recipe – Autumn Bark. Tuesday I shared that I made Minnesota Vikings Bark which I sent in a care package to my nephew at college. 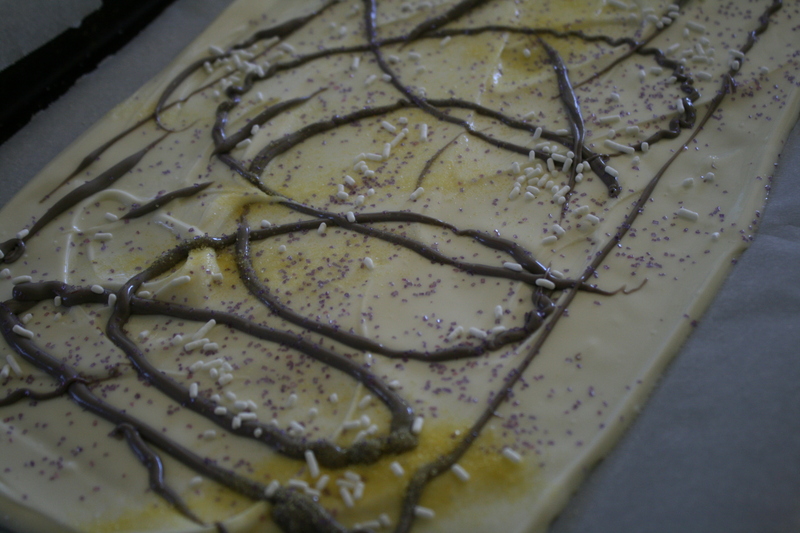 When I melted the almond bark, I decided to make two kinds instead of one huge batch to send him. 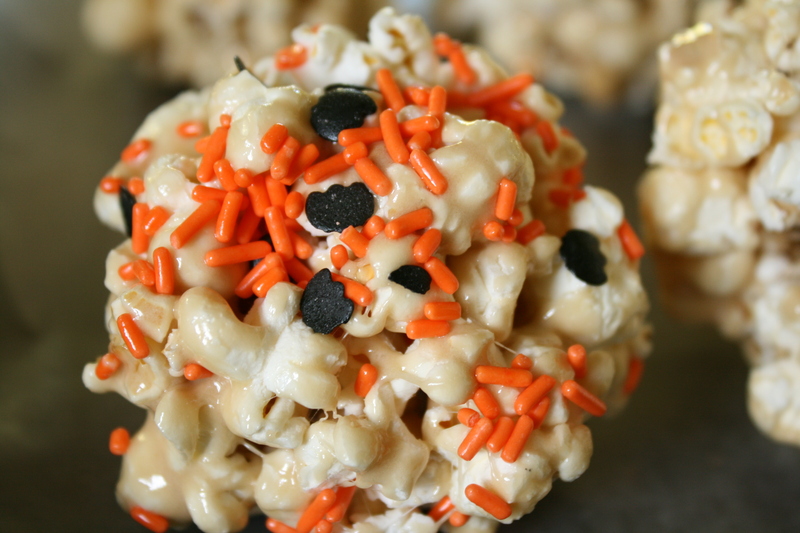 I have been making this treat for a few years now, and it’s just too much fun! 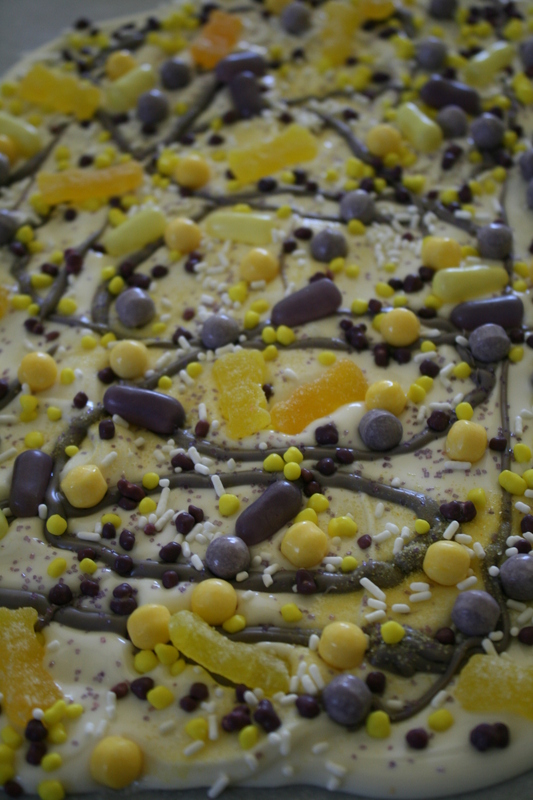 I have also made Easter Bark, Halloween Bark, and Leprechaun Bark. It’s a great way to be creative at the same time as being supportive of your favorite team or celebrating your favorite holiday. 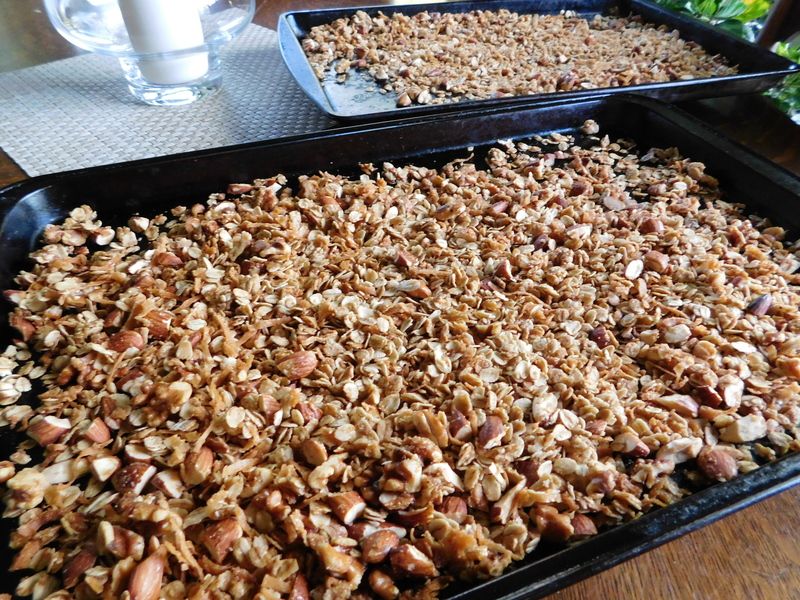 Spread half of the melted almond bark onto each baking sheet. Let bark cool and harden. 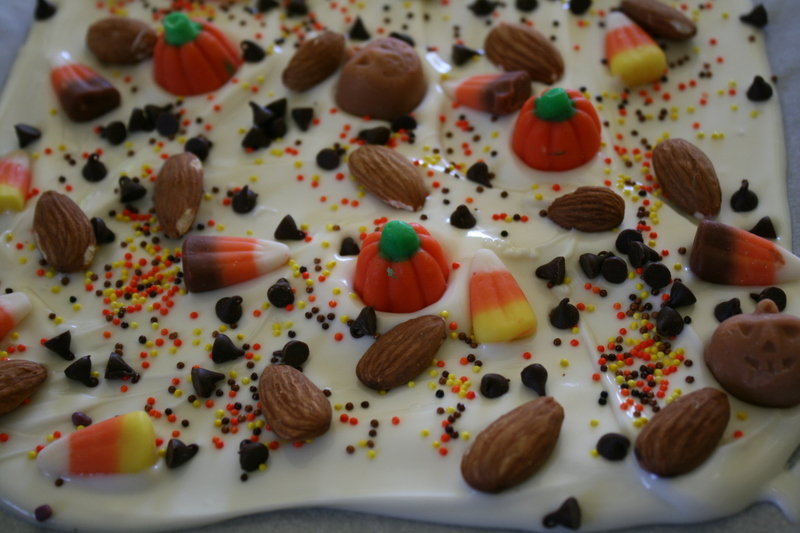 It’s a lot of almond bark to use the whole thing. When I was making the Minnesota Vikings Bark, I decided to make two kinds. Don’t forget to use parchment paper on the baking sheets. Not that I know anything about that. Really. Just don’t forget it. Trust me. It’s hard to get the bark off if you don’t use it. 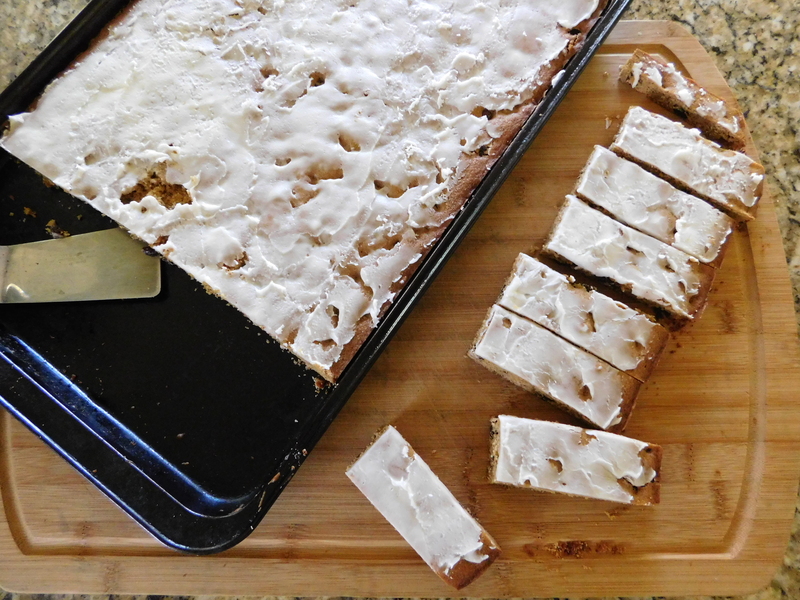 I wasn’t really planning on making two different kinds of bark, but when I saw how much almond bark there was when it was melted, it just seemed like a HUGE amount to make all one kind of. Since I wasn’t planning on it, I just had to used things I had in my cupboards, so I used fall sprinkles, roasted almonds, candy corn, mini chocolate chips, and pumpkins. So cute. I just love making these barks. They’re ridiculously festive. Who could resist these? The possibilities are endless! There are, what, 7 holidays a year, football teams, baseball teams, basketball teams, hockey teams, the list goes on and on! 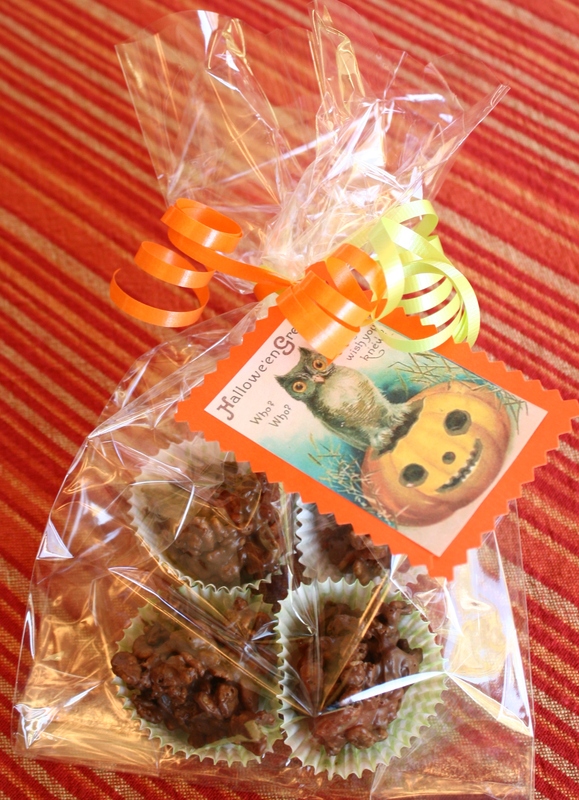 You can bring them to parties or give them as hostess gifts. Be creative. Make a few of these barks. 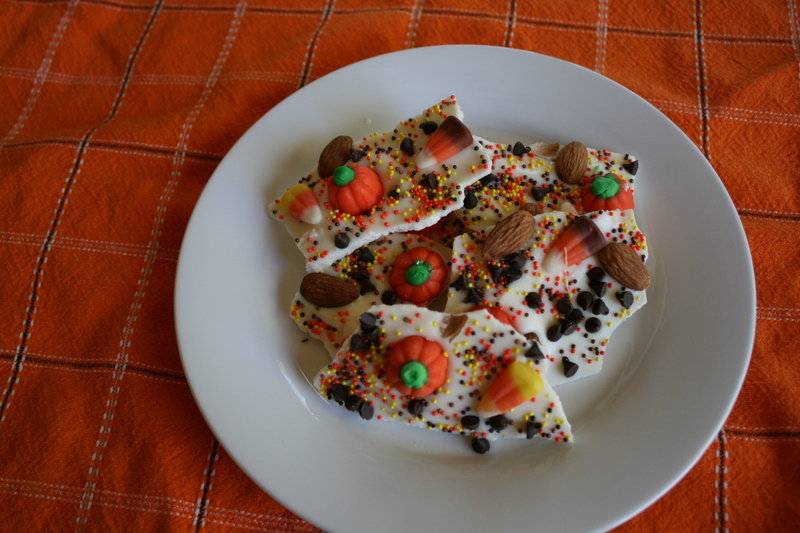 But right now, make some of this adorable Autumn Bark and make someone’s day! Today I’m making a batch of what I’m calling Minnesota Viking Bark, and on Friday, I’ll share a batch of Autumn Bark that I made at the same time. This batch is off to South Carolina to my nephew at college. He has grown up in Virginia, but since his mother (my sister) is a huge Vikings fan, he has had to be, too! All college students love to get care packages, so I hope he likes this one! 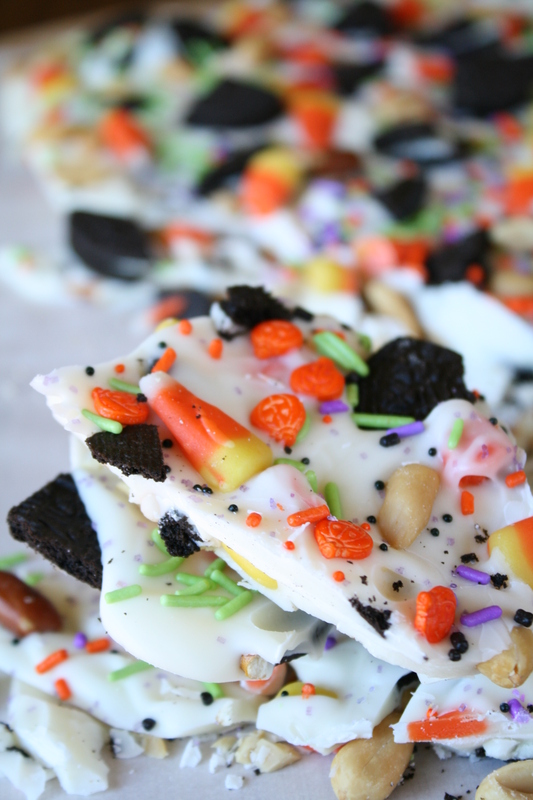 I’ve made a few batches of bark on the blog before: Easter Bark, Halloween Bark, and Leprechaun Bark. It’s so easy to do and it’s so fun to be creative. You can do this for any holiday or sports team. Go crazy with this! Cover two baking pans with parchment paper. Spread half of the melted almond bark on each pan. Let bark cool until it hardens. Since this is Minnesota Viking Bark, of course the colors are purple and gold (yellow). 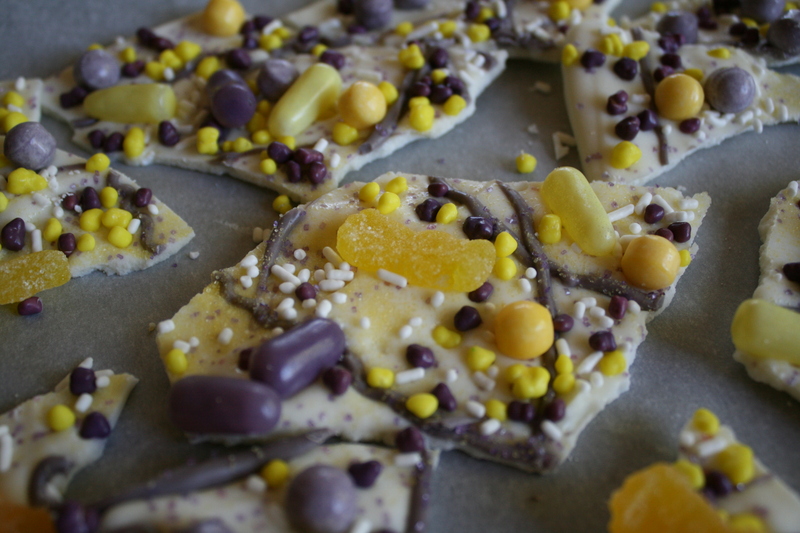 And yes – I did pick out purple and yellow candies from several different boxes of candy! 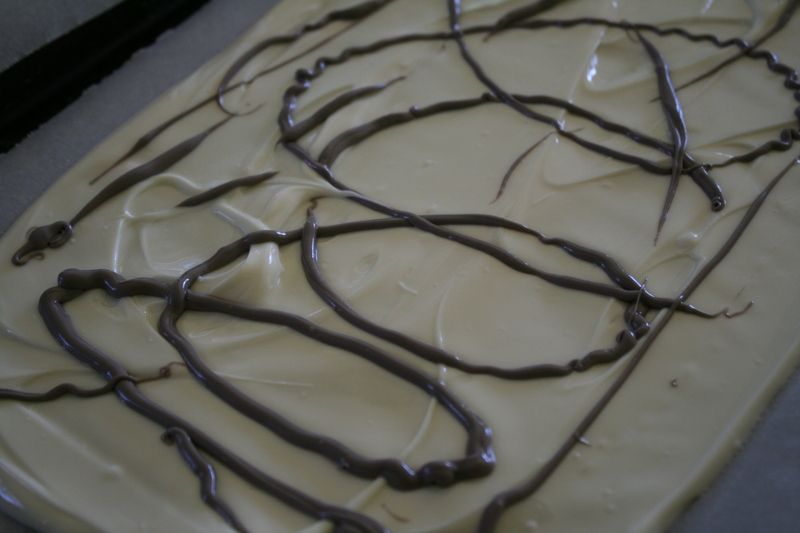 I put the melted almond bark onto two pans so I could make two different kinds of bark. You can’t use regular food coloring on almond bark because it makes it seize up and/or get grainy, so I used my powdered food coloring. You can see how old these bottles are by how ragged the price tags are on the lids. Powdered food coloring lasts a long time. A little goes a LONG way. 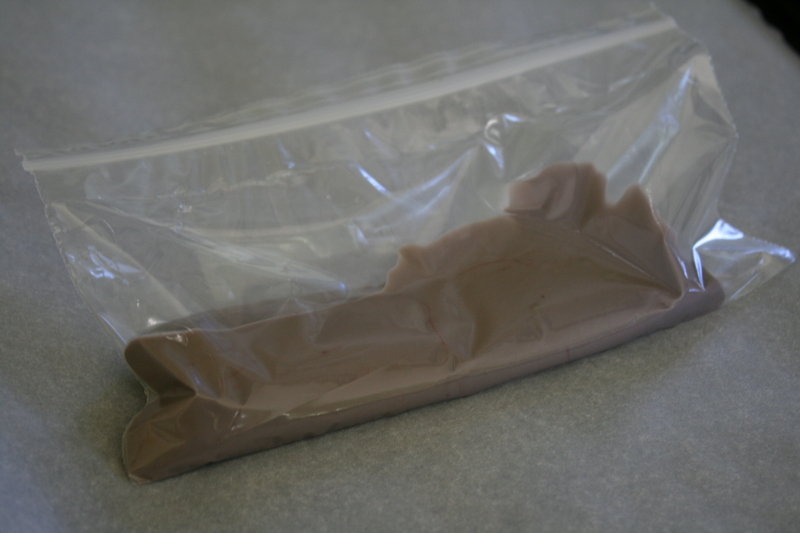 Before putting all of the melted almond bark onto the baking sheets, I took out a little of the melted almond bark, mixed it with tiny shakes of the blue and red powdered food coloring until I was happy with the purple color, and put it into a zip top bag. 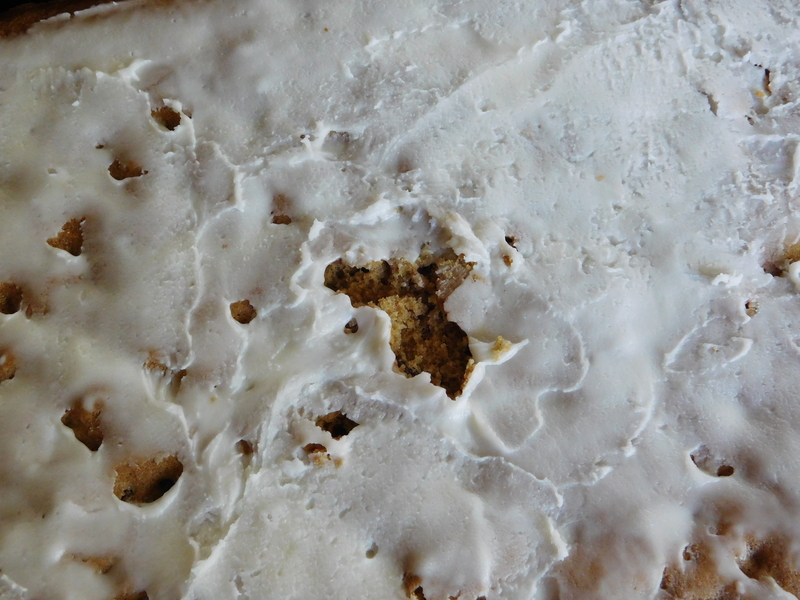 I cut the corner off of the bag and used it like a decorating bag to make squiggles on top of the white almond bark. That’s a technical term – squiggles. 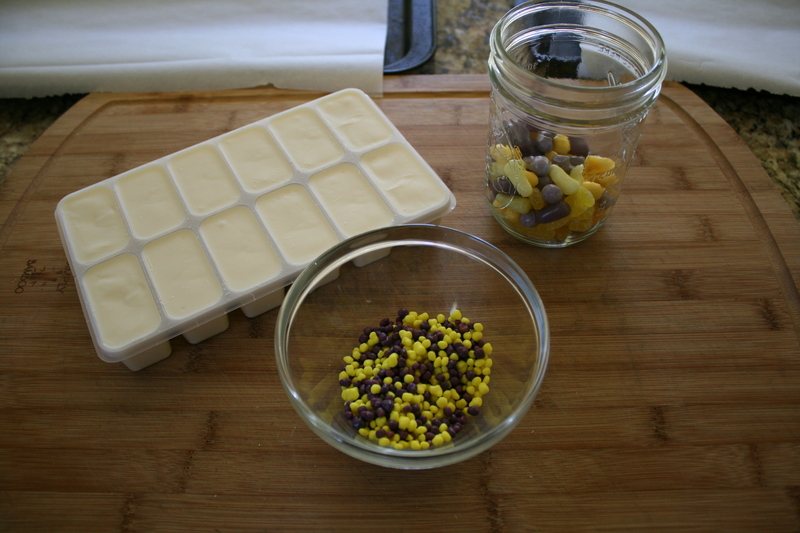 Next, on goes the yellow and purple colored sugars and the white jimmies. I put on go all of the cute candies next. Press them into the melted almond bark a bit to make sure they stay on the bark and don’t just roll off after it’s hardened. It’s so cute! I love how it turned out! I’m sure it’s tasty, too (no – I resisted the urge and didn’t try any before I sent it off to South Carolina)! Making this bark is just so much fun! I love doing it, as long as I can find people to send it to! I might have to make another batch of this for the fans here at home. Go ahead – make some of this Minnesota Vikings Bark and root on your (our) favorite team! 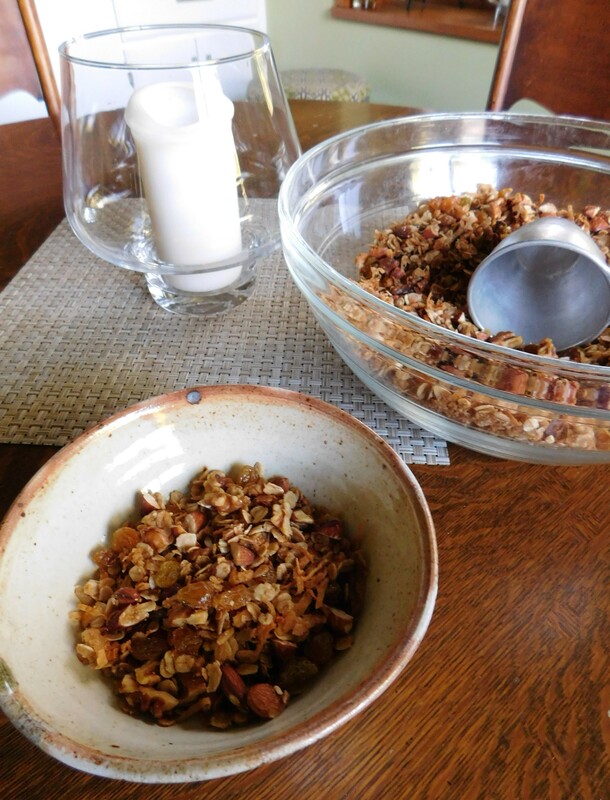 Today’s recipe for Granola comes from my oldest daughter, who found it online. It comes from Food Network courtesy of Alton Brown, and it is amazingly delicious! When I was recovering last spring after my bout of pancreatitis, for some reason I was very picky about what appealed to me appetite-wise. Granola was one of those things. How weird is that? I don’t know why. 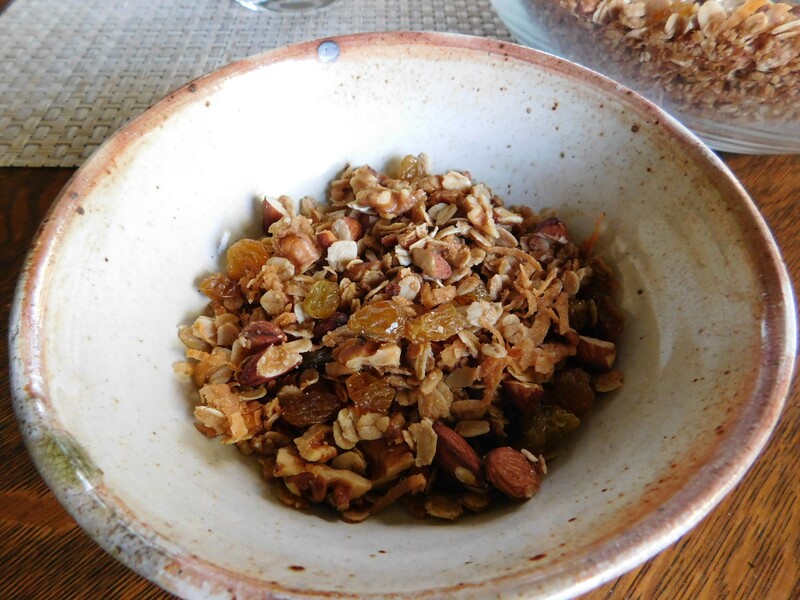 Granola is good, and I like it, but it’s hardly one of my favorites. Well, I’m sticking with it as a once-in-a-while snack and breakfast treat. You might even say I’m addicted now. I think this recipe is one that will be a keeper for me. This one still has a bit more fat and sugar than I’d like to be eating, in general, so I may have to try some different things with the basic recipe. We’ll see how that goes. I mean, I still want it to taste as delicious as this recipe and not like cardboard. It’ll take some experimentation, I’m sure, but I’m game. Meanwhile, I’m hooked on this amazingly delicious Granola. 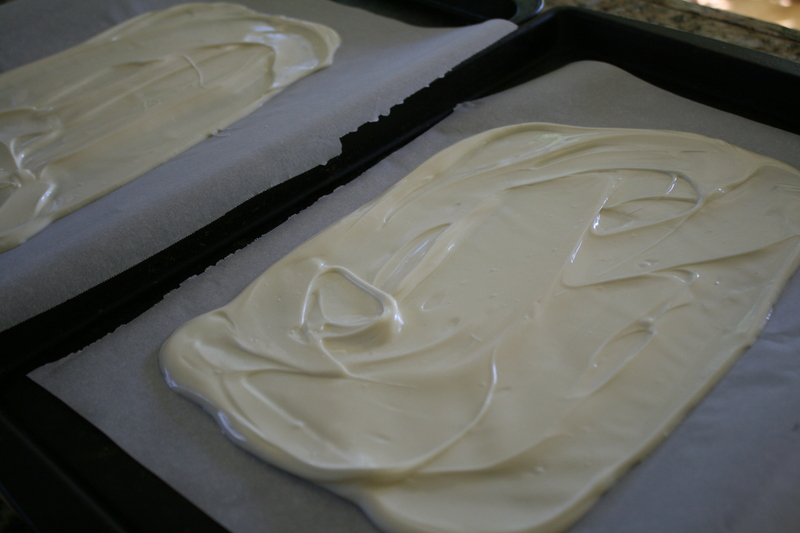 Combine both mixtures and pour onto 2 lightly greased baking sheets. 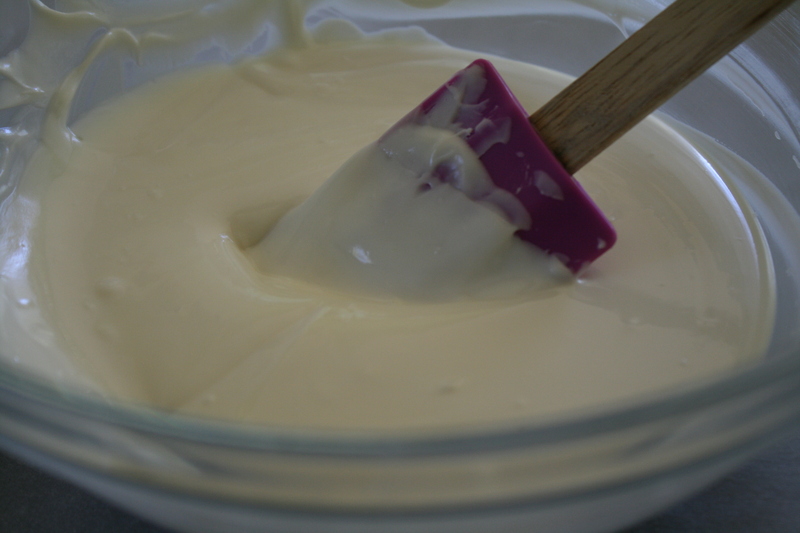 Bake at 250 degrees for 1 hour and 15 minutes, stirring every 15 minutes to achieve an even color. 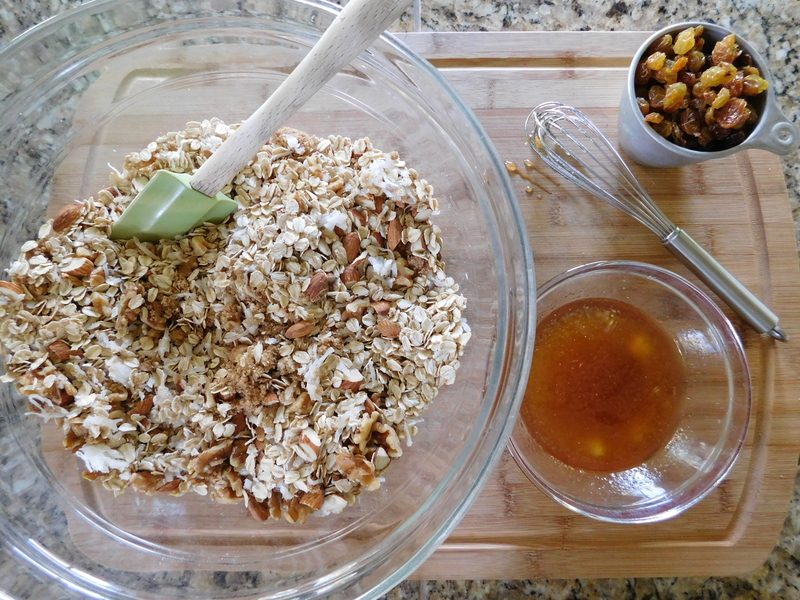 I have to admit that I haven’t made actual granola before. It was pretty easy to do, and I’ll be making it weekly from now on. I did also try a batch with half of the amount of oil, brown sugar, and maple syrup. It’s not as tasty, but is still VERY good, and it’s lower fat for Ebenezer. It’s pretty simple to mix it all up. Save any dried fruit for after baking or you’ll end up with hard little nuggets of who knows what. 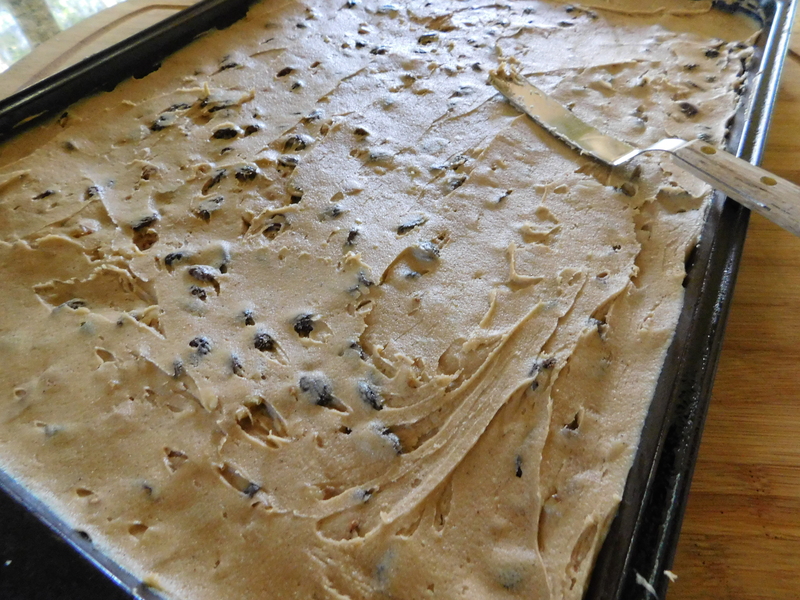 This batch was big enough for 2 baking sheets. It comes out of the oven all toasty and delicious. Have you ever noticed on a box of granola that a serving is 1/2 cup? Seriously? This is too good for just a 1/2 cup. This Granola is so good. It really is delicious. I keep using that word, delicious, but it is some SERIOUS delicious. 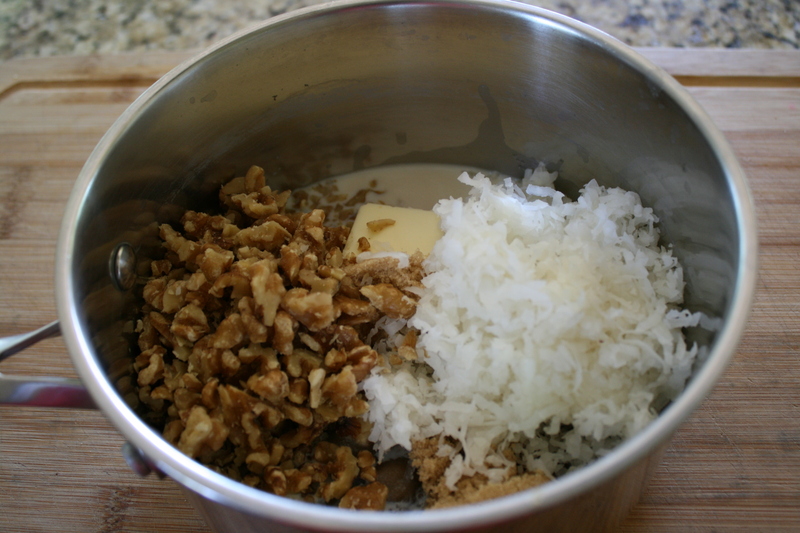 The almonds, coconut, and brown sugar go together so well and is so tasty. I just can’t stop eating this stuff. There are worse things to be addicted to, but I guess you could say that this Granola is my newest addiction. 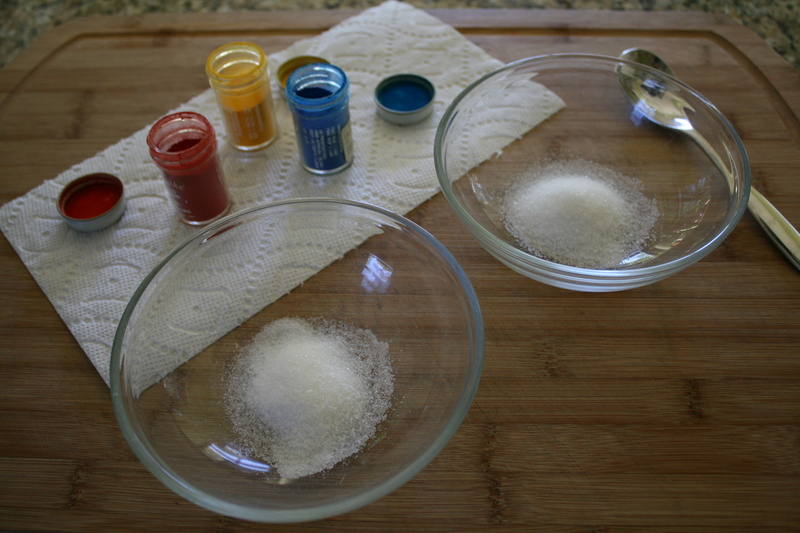 Since we’re heading into the time of year when we probably use colored sugar more than any other, today I’m going to show you how to Make Your Own Colored Sugar. You can use this to make any cut out cookies for all the upcoming holidays. You can use colored sugar for recipes like Sugar Cookies, Sugar Cookies #2, Sugar Cookies #4, Ginger Cookies #2 or any other cookie that calls for sprinkling on a sparkling coat of colored sugar. It’s so easy to do, you’re going to wonder why you’ve been using store-bought colored sugar. All you need is sugar and powdered food coloring. Now is the time to get your pretty colored sugars ready. 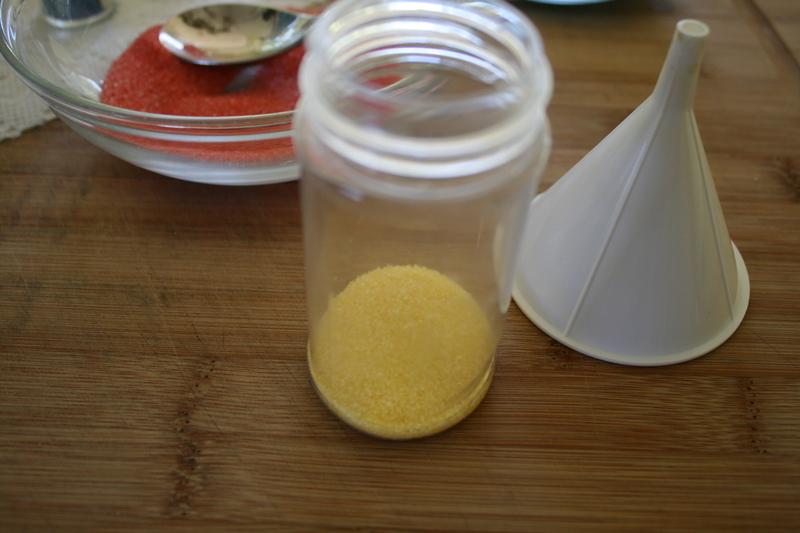 You’ll save time AND money by making your own colored sugars now before the holiday season starts. Get a good line-up of colors ready now and you’ll be good to go. I totally do this by how much I like the color. If you want to measure everything out, you sure can go ahead and do that, but I don’t. I always put the food coloring on a paper towel so it doesn’t color my cutting board. Have your sugar in bowls, ready for adding the powdered color. You can use as much as you will use for the holiday season, or make enough to fill whatever container you want to use. I tend to use the old containers from past sugars that were store-bought. 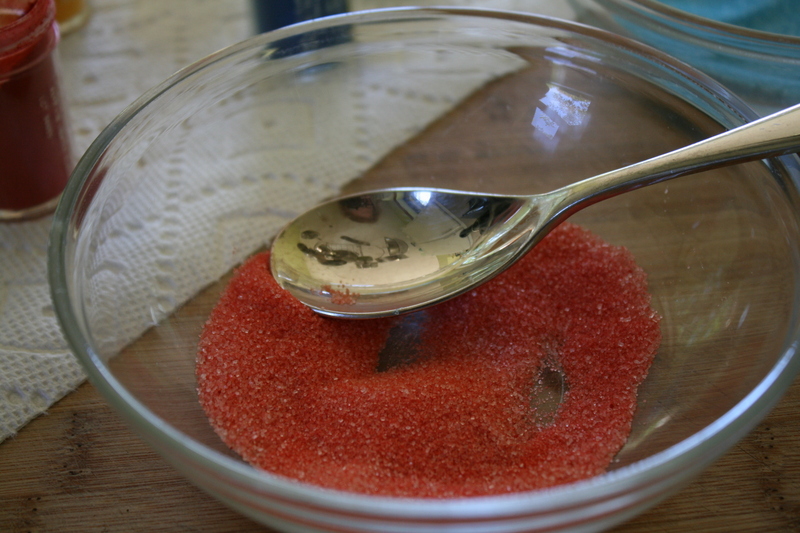 Just shake out some of the powdered color onto the sugar in the bowl. It doesn’t take much. You can always add more if you want a darker color. If you need to add more sugar to lighten it, you’ll just end up with more colored sugar. Stir the sugar and powdered food coloring together until it’s evenly colored. That’s it. 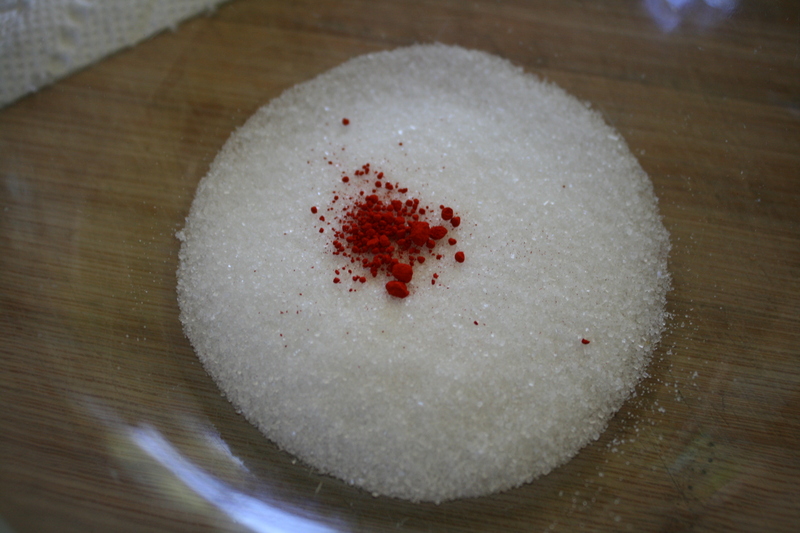 When using red – less powder will make it more of a pink color – more powder will make it more red. When the color is mixed to my liking, I use a funnel to put it into a bottle for sprinkling. You can store it in any airtight container and just sprinkle with a spoon, too. Either way works just fine. 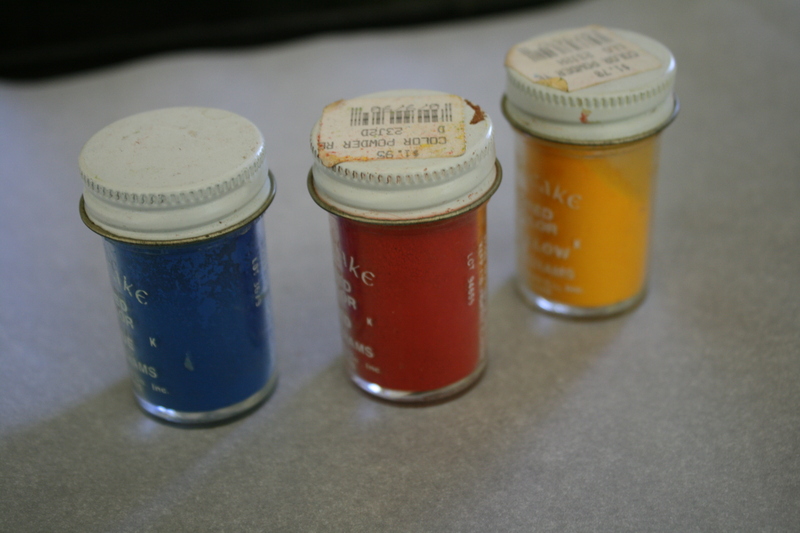 I use the three primary colors, because you can mix them to get any color you want. You can also buy many different colored powders so you don’t have to mix them, but to me, mixing them is half the fun! You can search for a color wheel on the internet to find out how to mix the three main colors to make more colors, like orange, green, and purple. I love doing this – and it’s so much cheaper than buying bottles of colored sugar. You can even make your own custom colors! Give this a try. 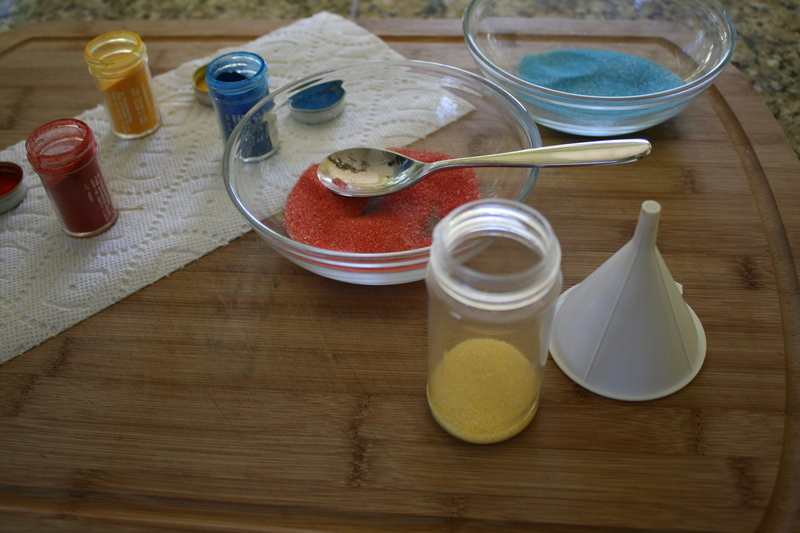 Now is the time – before our holiday baking begins – to learn how to Make Your Own Colored Sugars. 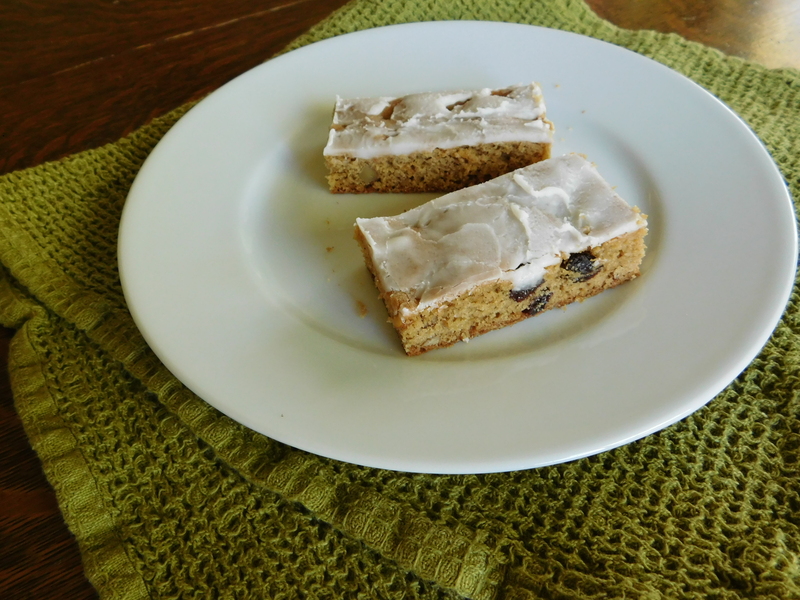 Today’s recipe for Oatmeal Cake comes from my mom, but I have never tried it! I haven’t tasted it and I haven’t made it! I didn’t even know there was such a thing! 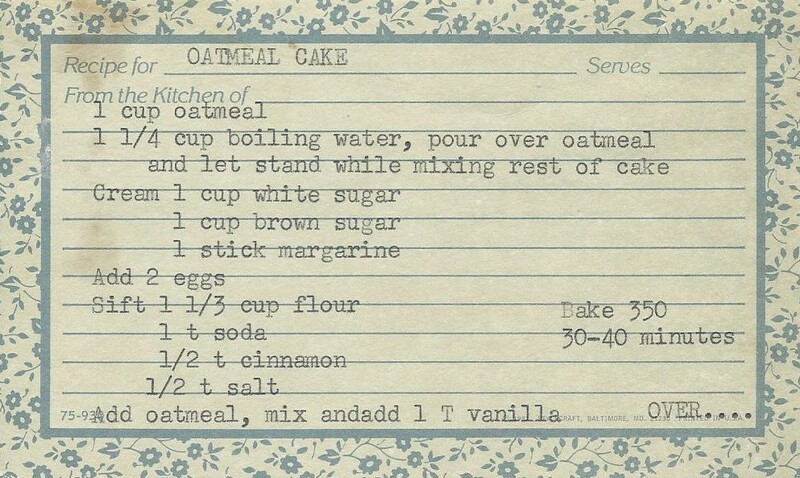 In fact, I have two other recipes for Oatmeal Cake in my collection, and they’re from 3 different people, and they’re all the same recipe! I guess we can agree that this must be a good one! My husband brought up the fact that the name Oatmeal Cake sounds very boring. 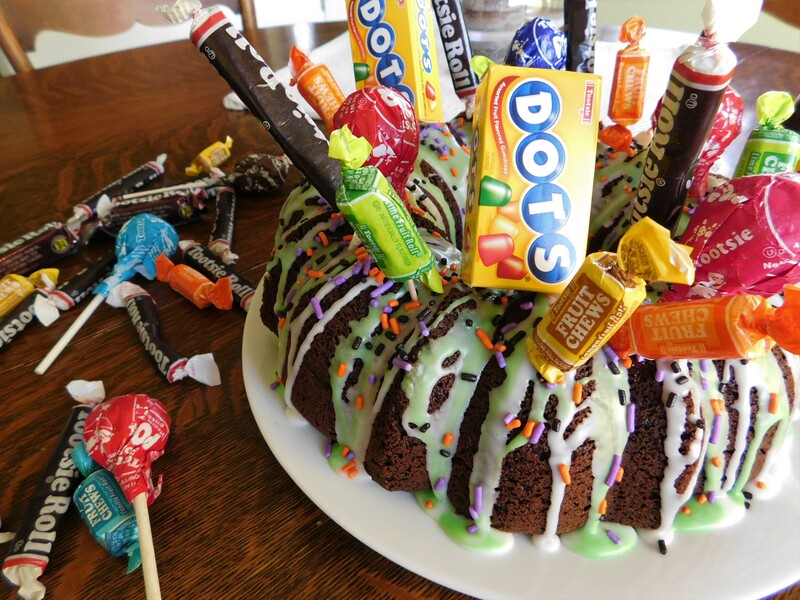 This cake is anything BUT boring. It really should have another, more exciting name like Candy Cake or Chewy Candy Bar Cake, but we’re going to stick with our original plan of leaving everything just the way it was when I found it on the recipe card. Just remember when you see the boring name of this cake – the finished product is NOT boring. It’s amazing! 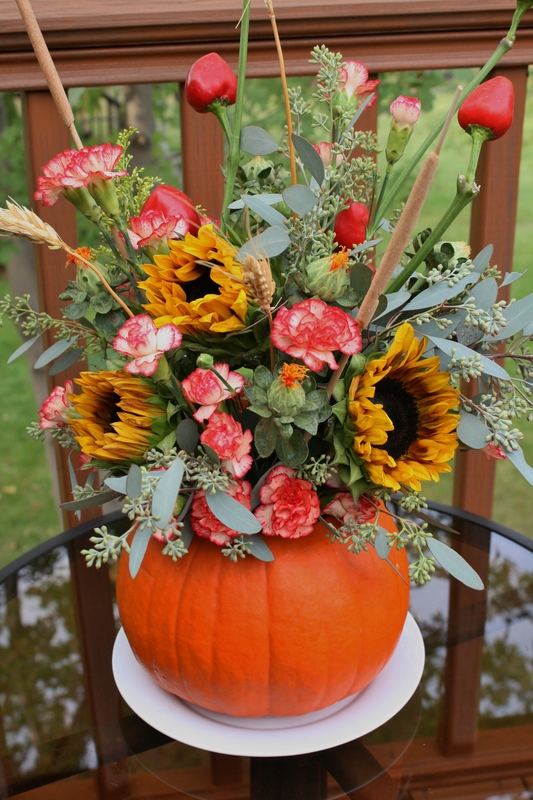 This is the perfect cake for fall! 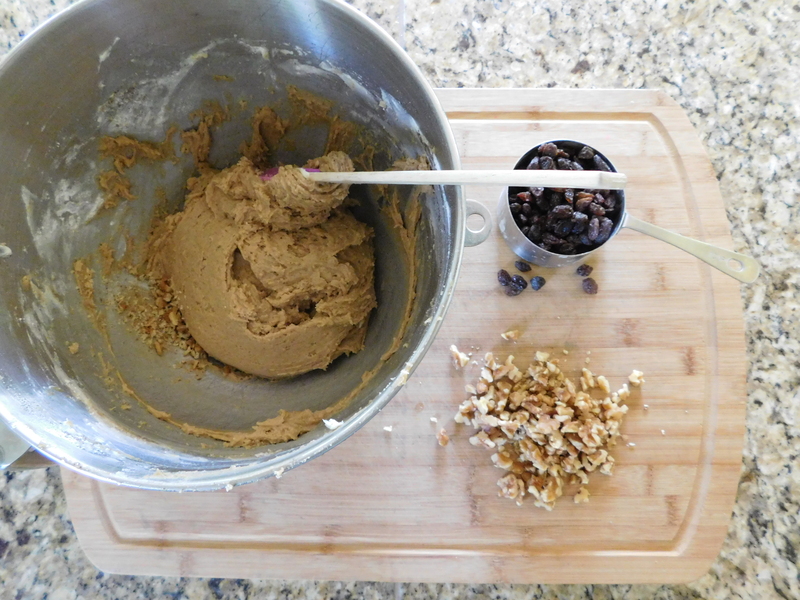 Pour batter into 9″ x 13″ pan. Let cool slightly before putting on topping. Spread on top of partially cooled cake. 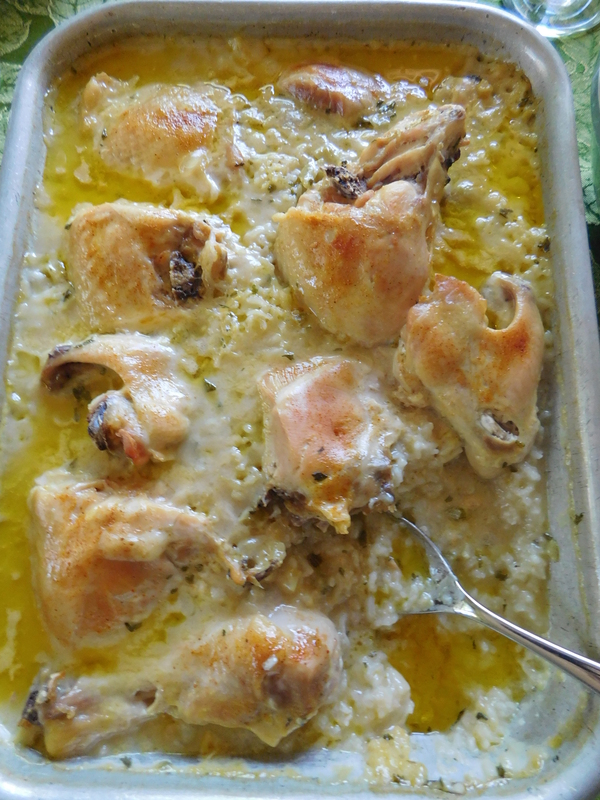 Put under broiler until it is bubbly (3-5 minutes), but watch closely – it can burn fast. 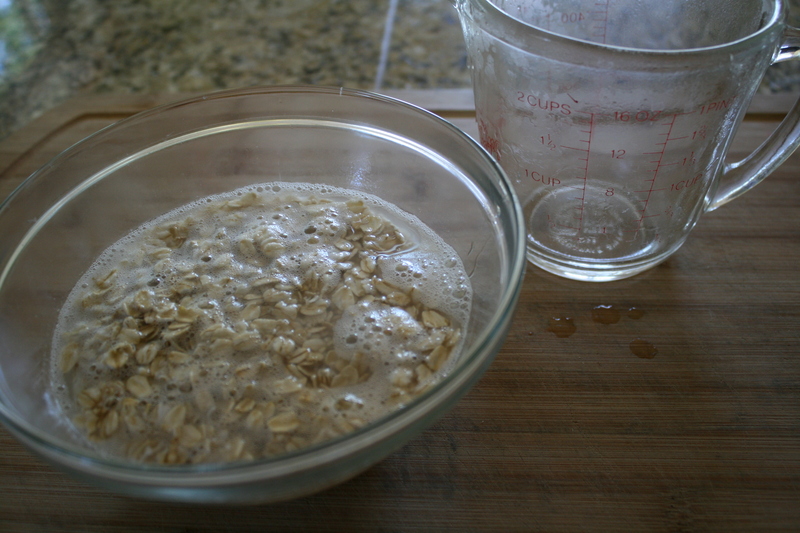 Letting the oatmeal sit makes it nice and soft when it’s time to add it to the batter. While the cake is an important part of the whole, and it’s really good cake, we all know that it’s just a vehicle for the frosting (or in this case, topping). I will say, this frosting (or topping) is absolutely delicious. 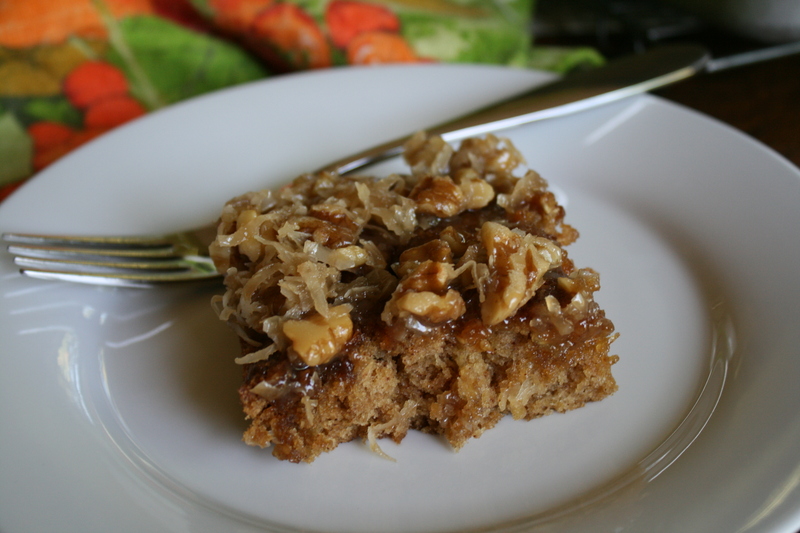 In fact, this topping is why this recipe should be called Candy Cake instead of Oatmeal Cake. Yes. It’s that good. 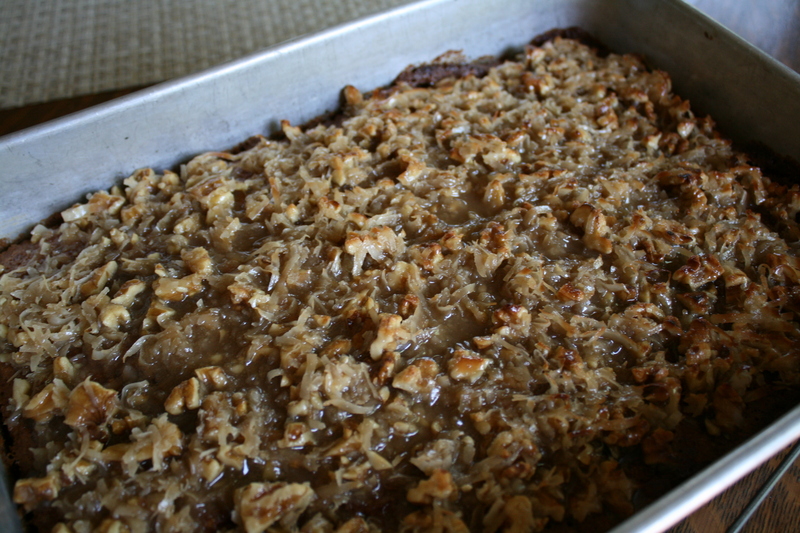 After the cake has been under the broiler, the topping has turned to a chewy caramel and the nuts are all roasty-toasty. Like a candy bar. I’m not even kidding. I just can’t believe I’ve never had this cake before. There just wouldn’t be any reason why I wouldn’t remember this one. It has all my favorite things: caramel, nuts, and cinnamon. This truly is the perfect cake for fall. 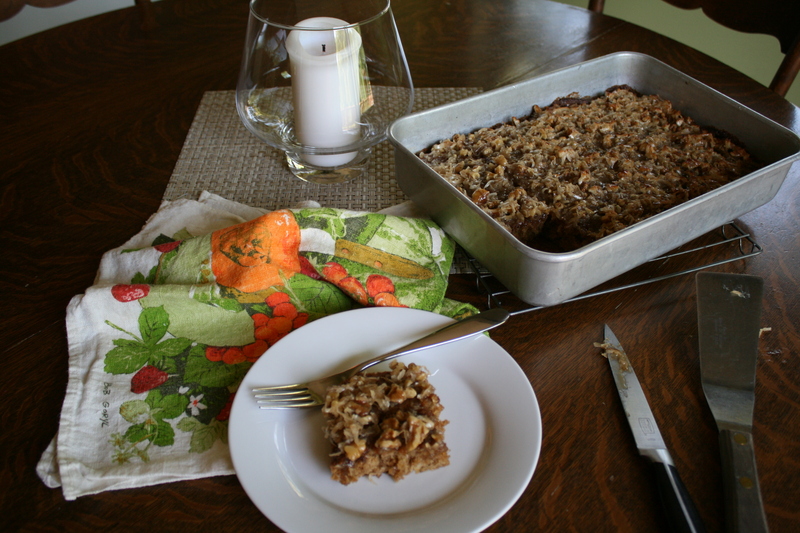 That little bit of cinnamon makes it just spicy enough and with the chewy caramel and toasty nuts after broiling – yum! It’s easy to make and with that broiler frosting, it’s FAST!! This is once again, one of my new favorites! 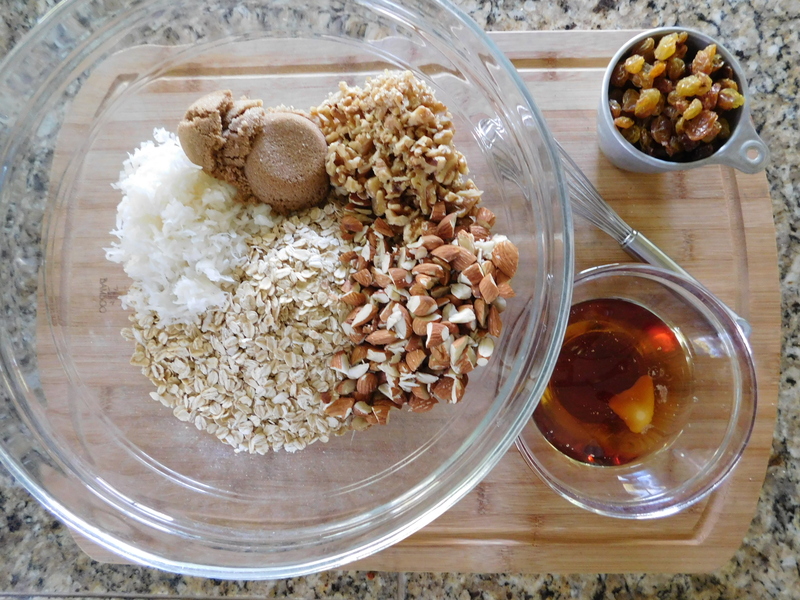 Even though it has a boring name and I think we should rename it Candy Cake, this one’s amazingly delicious – you’re going to want to make this Oatmeal Cake. 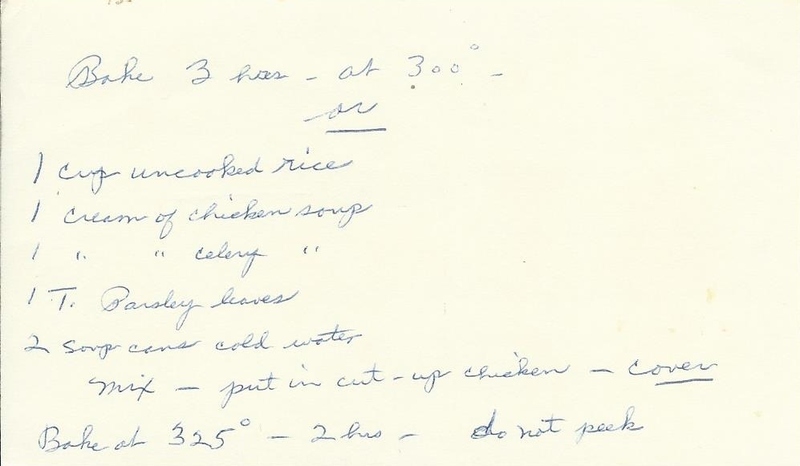 Today’s recipe for Baked Chicken #2 comes from the back of one of Grandma’s recipes. 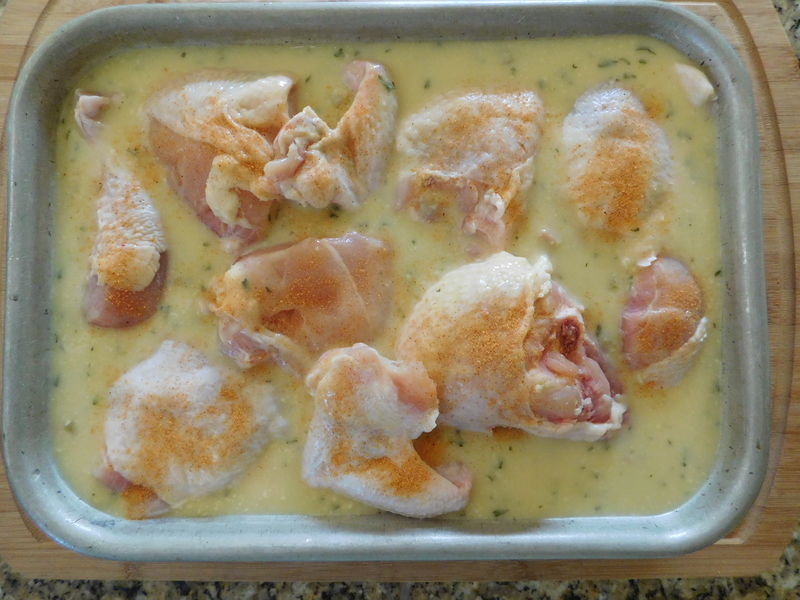 Actually, it was on the back of her recipe for Baked Chicken that I made several years ago. I was looking back at some of those past recipes, and realized that I never made the second recipe on the back of that card. I’m putting this one under the hotdish category, because it uses the same principle – meat, rice, and cream of something soup. We’re getting closer to comfort food weather, and these are necessary comfort food recipes: Baked Chicken, Easy Chicken and Rice, and this one. This one would be a perfect Sunday dinner. It’s easy, it’s no-fuss, and it’s delicious! Put into greased 9″ x 13″ pan. Bake at 325 degrees for 2 hours (DO NOT PEEK). Next time I’d bake about 1 1/2 hours and then take the foil off and let it go the last half hour to brown the chicken a little bit. 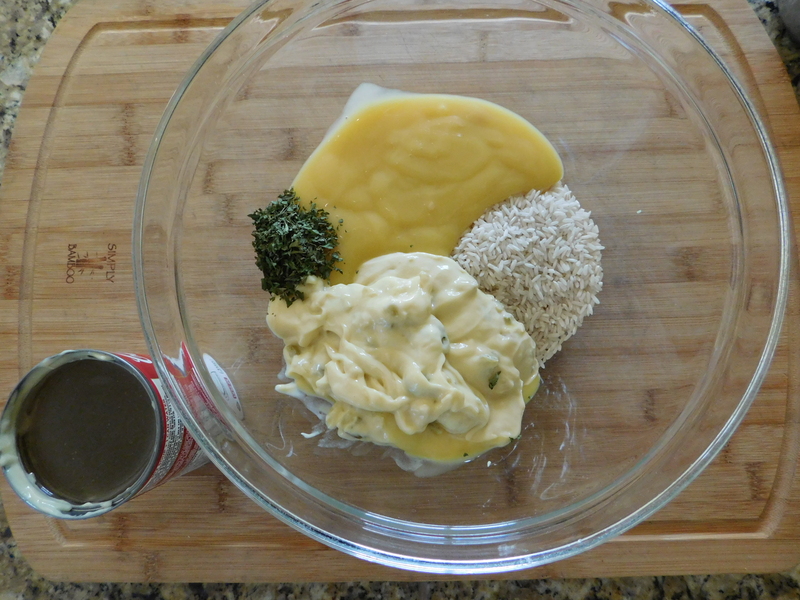 Mix up the rice and soups – and yes, you need to use regular uncooked rice. The soup/rice mixture goes into the pan, and then on goes the chicken (this chicken had gigantic pieces, so we cut the breasts in two). I also seasoned it with a bit of seasoned salt, because I had a feeling that this would be a little pale after being baked and covered with foil. After baking, I took off the foil and let it bake another 20 minutes or so, just to brown it up a bit (I was right – it did come out looking a little pale), but that made it somewhat overdone. The chicken was nice and tender, but the rice was overdone and a little mushy. I’d take the foil off earlier next time so the total baking time would stay the same. 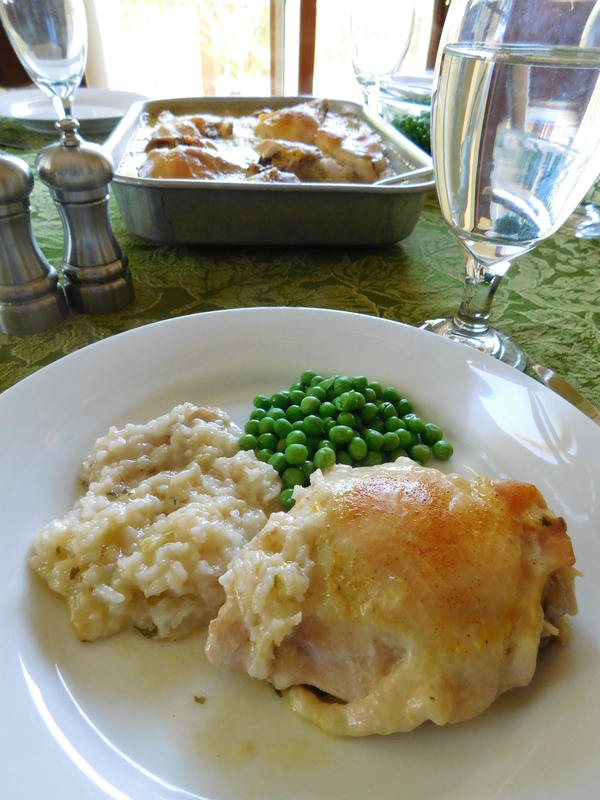 Oh yes – total comfort food! This WAS the perfect Sunday dinner. I just added a bit of green (peas), and it made for an excellent comfort food meal. 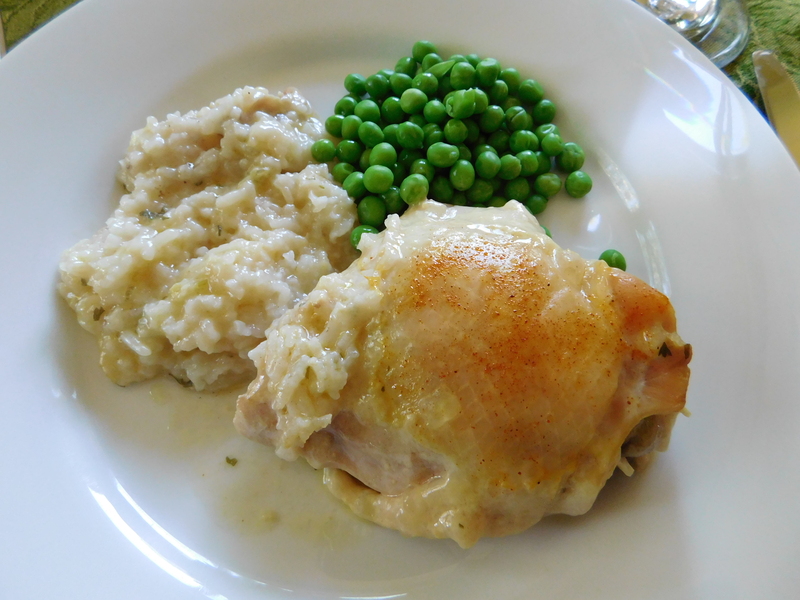 Incredibly easy and incredibly delicious – this Baked Chicken #2 is incredibly comforting!